GSSSB Jamadar Call Letter 2018: Gujarat Subordinate Service Selection Board GSSSB released notification regarding GSSSB Jamadar Call Letter 2018. 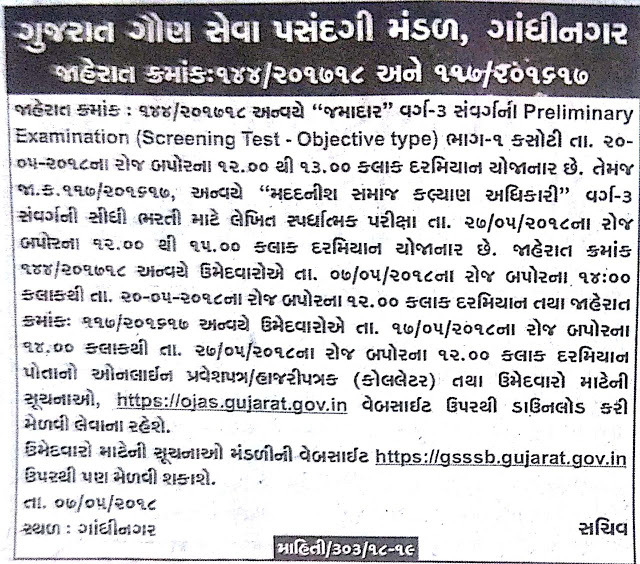 Board activated link for download call letter on ojas.gujarat.gov.in. Eligible candidate may download Call Letter 2018 from gsssb.gujarat.gov.in. The Gujarat Subordinate Service Selection Board earlier published advertisement for Jamadar (144/201718) post. GSSSB invite eligible candidate for these post through online application. GSSSB will be going to conduct exam on 20th May, 2018 at various centers across Gujarat State. Now Board announced notification regarding GSSSB Jamadar Call Letter 2018. Eligible candidate whose application confirm they may check exam date. Instruction for download call letter will be uploaded soon on its official website. Call Letter: GSSSB will be going to conduct MCQ- OMR Exam on 20-05-2018. Applicants successfully applied for GSSSB exam they may download their Admit Card from official website or direct link given below on this page. Candidates are advise to read all instruction well before download their Exam Hall Ticket 2017. Candidates should not enter in Examination hall without Photo Id Proof and Hall Ticket. Every student needs to carry the GSSSB Jamadar (144/201718) Call letter 2018 in the examination center to get a permit to sit for the exam. GSSSB Admit Card 2018 is candidate’s Entry Pass to give Mains Exam. If applicants did not have the Admit card at the time of Examination he/She will not be able to give the Exam. Candidates are advise to bookmarks this page and be regular touch on this page for get more latest updates about GSSSB Assistant Social Welfare Officer (117/201617) Written Exam Date-Call letter 2018.